Have you ever heard anyone say, 'Justice is blind'? Well, you can bet that Daredevil has! Being a blind superhero, one of his amazing abilities is his incredible sense of hearing. So we are almost positive he's heard someone say that phrase in passing... or, you know, from like all the way across town. Become one of the defenders of Hell's Kitchen when you throw on this Deluxe Daredevil Costume! Have you ever felt like your day job isn't helping to make the world into a better place? Well so did Matt Murdock, and he was a lawyer. A LAWYER! But he still felt like he could do more for the people of his city so he started fighting crime in the courtroom and took his battle to the streets. You'll be ready to leap from building to building with the Devil of Hell's Kitchen once you hop into this Daredevil jumpsuit. In no time the two of you could be tag-teaming King Pin or Bullseye and take them down with ease! No need to worry about getting that six pack or really getting in shape at all, this costume has muscles included! You'll look as if a comic illustrator created you, in other words, this costume is going to make you look amazing! One peek at yourself in the mirror and you might actually think that free running is your best mode of transportation. 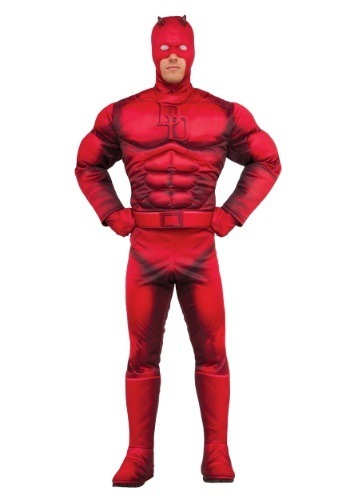 So if you want to finally bring change to your city and look good while cleaning up the streets, grab this Deluxe Daredevil Costume. Become the Man Without Fear! Lead those blinded by the darkness of the world into the light of justice and show them what it truly means to see!